It may still be a long way off, but we’ll take any details about the sixth season of Marvel’s Agents of S.H.I.E.L.D that we can get. One new tidbit has just come our way, courtesy of Henry Simmons and TVLine. If you remember, season five ended with Coulson going off with May, presumably to his death – while Daisy handed the reins of SHIELD over to Mack. Judging by this first photo of Director MacKenzie, SHIELD’s in pretty good hands. I mean, the organization looks to have grown enough for there to be background guys again! What a development. That sounds excellent, and I agree with Simmons’ assessment of his character. But I also agree with the proviso he added: that Mack can sometimes be too cautious, especially when it comes to people he cares about. 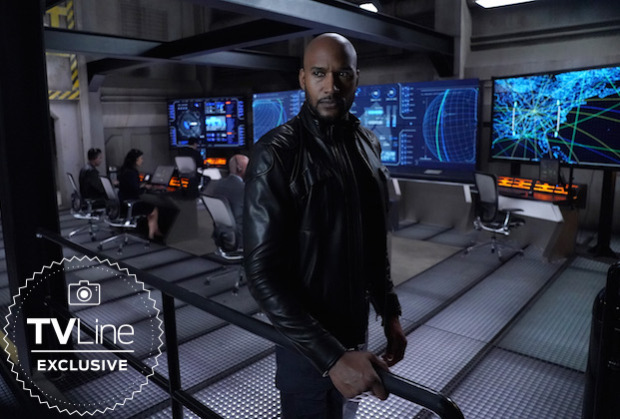 Simmons went on to say that one thing that could cause problems for Mack as the leader of SHIELD is “his reluctance to put the people he loves in the line of danger”. As director, he’ll have to make difficult decisions on that topic. “What sacrifices will be made?” Simmons hinted. Knowing Agents of SHIELD, we can be sure there’ll be plenty of heroic and challenging sacrifices, when it returns in the summer of 2019. Are you looking forward to seeing Director Mack? Let us know in the comments!